Parasparopagraho Jivanam (Sanskrit: परस्परोपग्रहो जीवानाम् Parasparopagraho Jīvānām) is a Sanskrit sutra or aphorism of the Jain text of Tattvārthasūtra. It is translated as: Souls render service to one another. It is also translated as: All life is bound together by mutual support and interdependence. The etymological root of the phrase Parasparopagraho Jivanam lies in the compound of three Sanskrit words: paraspara (mutual), upagraha (assistance) and jiva (living beings—jivanam is plural of jiva). This sutra has also been accepted as motto of Jainism. The aphorism Parasparopagraho Jīvānām has been accepted as motto of Jainism. It stresses the philosophy of non-violence and ecological harmony on which the Jain ethics and doctrine—especially the doctrines of Ahmisa and Anekantavada—are based. 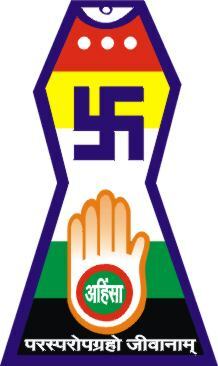 This motto is inscribed in Devanagari script at the base of the symbol of Jainism wihich was adopted by all sects of Jainism while commerating the 2500th anniversary ofnirvana of Mahavira. Māhavīra proclaimed a profound truth for all times to come when he said: “One who neglects or disregards the existence of earth, air, fire, water and vegetation disregards his own existence which is entwined with them.” Jain cosmology recognizes the fundamental natural phenomenon of symbiosis or mutual dependence, which forms the basis of the modern day science of ecology. It is relevant to recall that the term `ecology’ was coined in the latter half of the nineteenth century from the Greek word oikos, meaning `home’, a place to which one returns. Ecology is the branch of biology which deals with the relations of organisms to their surroundings and to other organisms. The ancient Jain scriptural aphorism Parasparopagraho Jīvānām (All life is bound together by mutual support and interdependence) is refreshingly contemporary in its premise and perspective. It defines the scope of modern ecology while extending it further to a more spacious ‘home’. It means that all aspects of nature belong together and are bound in a physical as well as a metaphysical relationship. Life is viewed as a gift of togetherness, accommodation and assistance in a universe teeming with interdependent constituents.